It's been a while since I blogged but JB has been on holidays all week and tomorrow then back to work. You know what it is like when someone else is around and you just don't get things done quite the same. Also I had surgery to contend with although as you saw from a couple previous posts that never stopped me. Today I finally got some pictures taken of things I am working on. 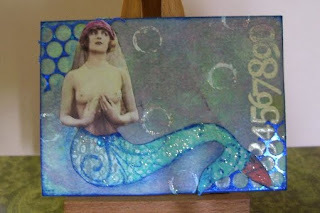 Most recently I did the 2 mermaid ATC's. The backgrounds were created with bubbles and food colouring. My friend Jan did this background for our background swap over at ATC for beginners and if you take a look on her blog you can find out how simple and fun it can be. Although my first attemp using the food colouring was a bit more muddy than I wanted but I liked the colour so I used it anyways. I also experimented using different coloured cardstock and also changed my layers of bubble colours to make interesting background effects. I also used some sequin waste my friend Jeanie recently sent me, you have to go look at both of these girls blogs. Their artwork is simply amazing and Jeanie recently got into watercolours. For a beginner I must say, she has talent!!! One of these ATC's will be traded for one I wanted on Jan's blog. Thank you girls for your continuing inspiration and all my other paper crafty friends. 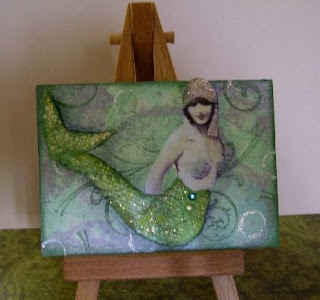 For the mermaid tails I used painted paper towels and then stamped on them and used Stickles for some added glitz. And these ornies are new. The stockings I just whipped up last night before I headed off to bed, no hangers yet but I will get to that today. 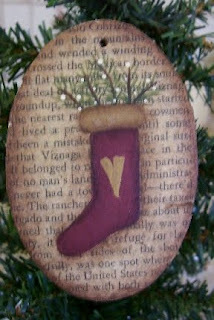 This stocking is a Kim Klassen design from the Q&E magazine from a few years ago. Again I used text for my background, sealed it on the wood, let dry then painted away. I really like how the shading on the edges although you can't see much of it here makes it look very antiquish (is that a word?). I love painting candy canes, I can't eat them but I love painting them, this one looks like you could lift it off the page and eat it. And finally, I picked up the week my hand was all bandaged up, a few old torn up books and a recipe book. I love the old books for their discoloured and yellowed pages. 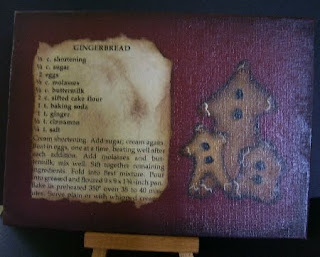 This I antiqued myself it is a gingerbread recipe then I used a Katrina Roncin design to paint the gingers on here. I will drill some holes and add some homespun so it can be hung in a kitchen. This is a 5x7 canvas and took no time to paint. Well that is it for now. I am continuing with other projects. This morning I had to clean house while JB went to our property back north to collect more wood for us to burn this winter. I seem to get more cleaning and multi tasking done and I can whip through with no questions being asked. Oh well, life isn't all about housework I say. Take time to enjoy each other and help, more hands make light work. Till next time...have a great day. If love everything here! If you make more, please keekp me in mind for a trade! The ornies are so much prettier than anything I've seen at a store. And what a fantastic idea- with the yellowed recipe and the gingerbread men! The neat thing is, I have some recipes from my grandmother, mother and even me that are getting yellowed. This would be a lovely way to preserve them - especially preserving the handwriting! I am not sure which mermaid is going to Jan yet, haven't decided but you can have whichever one doesn't go. I super like your ornaments, actually all your pieces. Really nice. I like to get things done while my sweetie is gone too. :) Have a great week! I LOVE all of your christmas 'ornies' as you call them! They are gorgeous. I've bookmarked your blog so will be back to visit! I try and take part each week in the Inchy by Inch Challenge - (they are addictive!) and saw your comment there. A new challenge is set by Fiona every Monday. Hope to see you there!!!!! Hi lesley - thanks for your comment on inchy challenge blog - our challenges start every Monday. There will be a new one up sometime today. 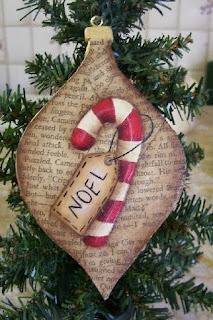 Love your ornaments, great ideas - I love all things Christmassy! ...and your christmas ornies are fabby too! Thanks for sharing, your ATCs are truly beautiful!